Before I get into this article I want you to answer a few questions. How long have you been playing soccer? Where would you say your skills are at right now? Are you a beginner, or a more serious player? What are your long-term goals when it comes to soccer? What position do you play? Is this the position you want to stay in? And lastly, what soccer techniques do you want to learn? Whenever someone comes to me and says they want to improve on their soccer technique, these are the initial questions I ask them. Improving your soccer skills is a personal journey that is different for everyone. It all depends on whether you are serious about pursuing a professional career in soccer or just want to improve certain skills for a recreational league. 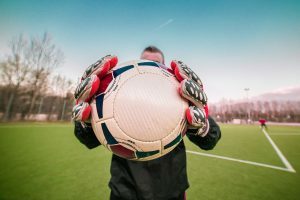 Either way, the first step forward is making a commitment to developing your skills and from there, you will be well on your way to improving your overall soccer techniques. Before even beginning on a few basic soccer techniques, you first must build up your physical endurance and strength. Soccer is a sport that your body will endure a lot of cardio. So even before you pick up a ball, you must first make sure that you have the stamina to even play a full game. If you cannot run on the treadmill for at least twenty minutes straight, you are not ready to pick up a soccer ball. I know this may sound harsh, but I tell this to any player that I begin teaching soccer techniques too, and it works. So I recommend going to a local soccer field and begin with running five laps around the whole track. If you can’t do that yet, that is okay; just start out running and walk the rest if you must. You want to build up to running five laps around the track. If that is a piece of cake for you, start building on top of that and see if you can do seven or eight or even ten! You want to also work on your sprinting, so while you run, sprint as fast as you can for 30 seconds and then lightly jog for a minute, and then sprint for 30 seconds… etc. This will just keep you toned and in shape for your upcoming soccer games. After you’ve built up your endurance, you will be ready to start focusing on learning basic soccer techniques. Before I dive into them let me preface with this: At times, you may feel discouraged and this is completely normal. In fact, every player professional or amateur has been where you are right now. There will be some techniques that you will pick up fast, but others you will need to work for. My biggest piece of advice is: Do not give up! The only way you will fail is if you give up on yourself. Stick to these drills, stick to your training, and I promise you, your soccer technique will build and be top notch! This is what has been regarded as the safest way to pass a soccer ball during a game. On top of that, it also looks professional, and is a basic technique that you can learn. The reason this pass is so accurate is because it is the largest contact area on your foot where you can hit the ball. Keep training the inside pass during passing drills, running down the field passing back and forth. While this is not as accurate as kicking with the inside of your foot, it is necessary to learn as a basic soccer technique. Simply stand far apart from your partner and alternate passing with the inside and the outside of your foot, so you can feel the difference. It will impact the way you play. This is one the most basic soccer techniques that you need to learn as it is needed for every game. It is the way you keep the ball from a defender and the main way in soccer to maintain possession. To learn more soccer techniques research online, or ask a trusted professional player or coach!